Telaga Terminal is a top ferry operator and renowned for its ferry service from Langkawi to Koh Lipe and from Koh Lipe to Langkawi. 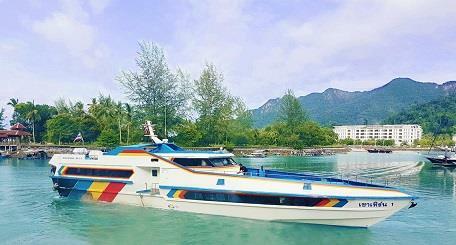 The company has been running since 2005, providing convenience to many locals and even tourist to travel between Langkawi and Koh Lipe. The quality service offered by Telaga Terminal is one of the reasons why many use their ferry services. The ferry is in a good condition and they always strive to provide a comfortable and safe journey for their passengers. In Langkawi, the ferry departs and drop-off the passengers at Telaga Harbour International Terminal in Pantai Kok. Meanwhile, Koh Lipe does not have official pier. From the Telaga Terminal ferry, the long-tail boat will transfer the on-board passengers to the beach. The cost for the transfer is included in the Telaga Terminal ferry ticket. The port in Langkawi is the closest port from Koh Lipe. The trip duration is around 1.5 hours. From Langkawi to Koh Lipe, the departure time is at 9.30AM and 2.30PM. Please note that the check-in counter closes 30 minutes before departure. Therefore, please remember to reach the departure point early.